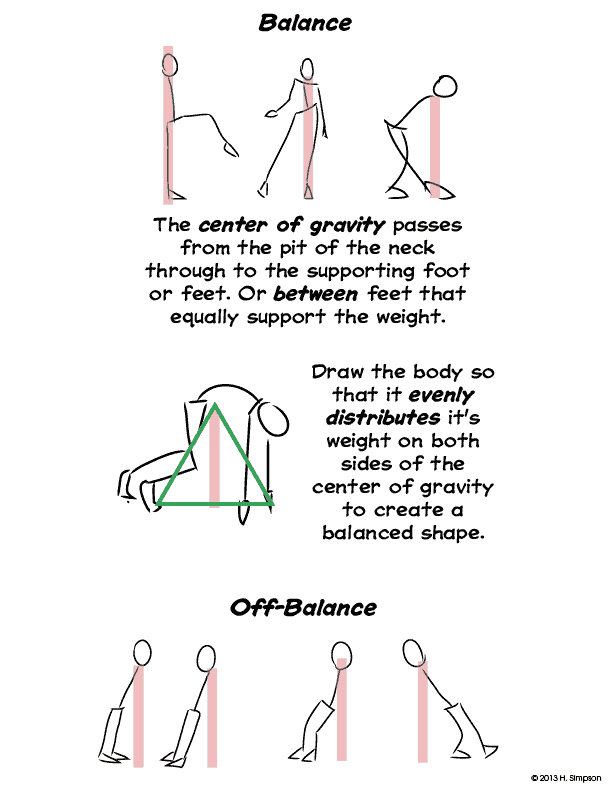 It's important to keep grounded figures balanced when standing and when doing action, unless they are falling. It's good to act out the action you are drawing so you can feel it. In some cases, you may want to photograph someone performing the action. There's no reason in this digital day and age that you do not have a camera near you somewhere. You don't have to look like your character, be the same gender or even have the same body shape of your character to take a selfie. You want to see and feel the gesture of the action and feel the balance a character needs. Keep in mind that your characters have weight. Think about direction and balance. Think about active and passive lines. Think about where the body will stretch and where it will pinch. Always be mindful of proportions. Be aware of the center of gravity of your character. 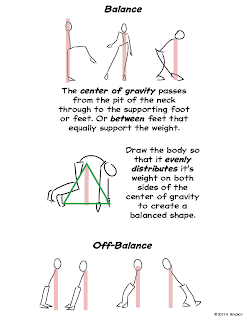 You should be able to draw a line to find the center of gravity from the pit of the neck to the supporting foot or feet. Or that line may pass between the feet when they support the weight equally. Sometime the line goes straight down. Other times it is diagonal and travels from the pit of the neck to the supporting foot in extreme action. What happens when icons meet?